Buying or selling a real estate property is not as easy as it seems. You need to learn how to navigate the real estate process to prevent any contract-related issues . If you are uncertain about how the process works, you can always seek help from an established title company in Washington, D.C.
Eastern Title, a title company in Washington, D.C., can help simplify real estate procedures. We have an experienced team who keeps our clients’ best interests in mind with every transaction that we take. For all of your real estate needs, trust none other than our title company in Washington, D.C. Eastern Title also offers competitive rates for our services. Why You Need a Title Company in Washington, D.C.
Handling real estate transactions can be confusing at times, especially for first-time buyers or sellers. For a hassle-free process, it is better to seek help from the professionals, such as home inspectors, appraisers, and escrow agents. The latter act as mediators and ensure that legal documents are all accounted for. For assistance in home buying or selling, hire a representative from our title company in Washington, D.C.
At Eastern Title, we put a premium on customer service. As a title company in Washington, D.C., we work hard to ensure a smooth transaction for our clients. Whether you need help with title insurance, a title search, or refinancing, you can count on our reputable title company in Washington, D.C.
What to Look for in a Title Company in Washington, D.C. Experience of Staff of a Title Company in Washington, D.C.
Before hiring a title company in Washington, D.C., check the length of their staff’s experience. Look for a title company in Washington, D.C. with a knowledgeable team who has handled different real estate transactions. Eastern Title, which is a title company in Washington, D.C., has more than 20 years of industry experience. Over the years, we have gained the necessary knowledge and skills. For a worry-free transaction, work with our title company in Washington, D.C. Customer Service of a Title Company in Washington, D.C.
Get the services of a title company in Washington, D.C. that makes you feel comfortable. Observe how friendly or accommodating the staff is when you visit a title company in Washington, D.C.
At our title company in Washington, D.C., we have a highly skilled team who provides sound advice to our clients who need assistance with the real estate process. We aim to help individuals make well-informed decisions, whether they are selling or buying properties. Location of a Title Company in Washington, D.C. Some real estate transactions can be processed through emails. However, a few meetings would also be necessary to close a deal. Eastern Title, which is a title company in Washington, D.C., also has locations in Virginia, Maryland, and Florida. Recently, we started serving clients from Tennessee, North Carolina, and South Carolina. For your convenience, get the services of a title company near you. Reputation of a Title Company in Washington, D.C.
An esteemed title company in Washington, D.C. can be easily found online. Read about the company reviews or client feedback. In addition, you might want to check if a title company in Washington, D.C. is recognized by different associations or professional organizations in the real estate industry. 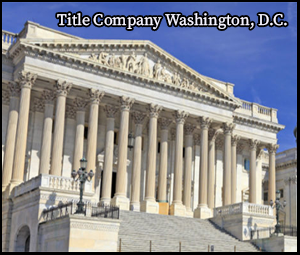 Do You Need a Title Company in Washington, D.C.? Contact Us Today. Real estate transactions can be tricky, especially for a first-time seller or homebuyer. Fortunately, our staff at Eastern Title can easily walk you through the process. You can be confident that we will assist you from start to finish. Feel free to get in touch with us if you are looking for a title company in Washington, D.C. Also, visit our website for more information about our services as a title company in Washington, D.C.